I had a TomTom ONE for ten years paying for map updates every three months. I finally goosed it trying to install a new battery. My present TomTom is a GO 6200 (WiFi) which, after a number of experiments including shortest and quickest routes, I have set in Eco friendly mode. Yesterday I set a route from a site south of Banbury to home in West Cheshire via the storage site in Oxfordshire and a stop in Warmington. As soon as the vehicle started to move all nearby roads with traffic delays showed up on the SatNav and current delays further en route recalculated my ETA. If the delay times changed the ETA recalculated. Fifty miles from home I was advised of a 20 minute delay ahead only 4 miles from home. TomTom continually reported the delay time until I was about ten miles away when the delays ceased. When I arrived at the exact location of the delays I saw thirty foot high tree which tree surgeons had evidently been recently trimming. Despite delays and slow running on the M42 and the M6 I arrived home within one minute of forecast ETA from leaving. My introduction to the caravan experience in the late 1960s by way of hired touring caravans. The first was hired from MG Caravans Todmorden about 30 miles from my then home. Our first tour was 500 miles of north Wales down to Aberdovey. Two adults and four children from 2 years to 9 years. My company car was a Ford Cortina Mk 1 1500 estate was fitted with a towball. The next tour two years later was of southern Scotland from Yellowcraig cc site in the East to Ayr in the West in a caravan hired from company based near Bromborough Wirral. The towcar was a Mk2 1300 saloon to which I fitted a towbar. One of the caravans was a Sprite Muskateer but I can't remember the make or model of the other caravan. Two or three years later a business associate allowed us to use his 15 foot Eccles which was pitched at the Warren in Abersoch North Wales. The pitch was fully paid up and the only condition was that I towed it back to his father's caravan business in Helsby. After taking the family home, I returned to Abersoch with an empty car and towed the Eccles home. Oh yee of little faith. Matthew 6:30 According to Wiki Though in May I have 4 hospital appointments. Your juxtaposition or interchange of Anglesey, the island, and Holyhead, the town on Holy Island where the ferry terminal is located is quite confusing. However, like yourself, the last time I stayed on Anglesey, pre- SatNav, for the Dublin ferry the main route was the A5. I stayed overnight at a small site close to a reservoir five or six miles to the north west of the an A5 road junction. Those six miles were quite challenging with a small caravan under tow. Fortunately my trusty navigator was spot on with her choice of route. The above rig has been shown at several caravan shows in the past ten years. I seem to remember that it was built to demonstrate/validate a Bristol University engineering student's thesis about twenty years ago. I have often wondered how close it is to real caravan world towing dynamics. I once jokingly asked a demonstrator if there any Certificate of Conformity for the towing vehicle and the rig. For some reason the demonstrator was unamused. The trailer seems to running on cross ply tyres. I first went to the Wharfdale site in pouring rain, many years ago, either on opening day or re-opening after re-furbishment. Many pitches were waterlogged and pitches were being allocated by the new Warden team. I was initially allocated a pitch close to the play area until the Warden discovered that I was a single male travelling alone. I was then allocated a pitch close to the toilet block. Perhaps I was thought to be an incontinent peado. There were teething troubles with the cold water tank in the toilet block springing a leak on the first day. If I recall correctly only green toilet fluid was acceptable. On my next visit I overshot the entrance and had to travel to Ketttlewell to turn the outfit round. That meant that I was travelling on the not recommended route. That's 64% of my daughter's caravan's 700kg unladen weight. BTW the caravan is a Freedom. In my case where I store my ATC and motor mover fitted caravan containing awning, aquaroll, cutlery, crockery, cooking utensils, bedding and wastemaster and other caravaning necessities 130 miles from my home there is very little remaining payload. This means that I have to make do with 2 pairs of clean undies and a clean hanky. When my companion joins me bringing with her a 30kg suitcase for an overnight visit the case stays in the tug. In practice the "extras" are carried in the estate car towing vehicle and sometimes some of the caravan stored contents are transferred to the tug when travelling. With a previous caravan which was also stored we were able to make use of the caravan facilities for comfort breaks. 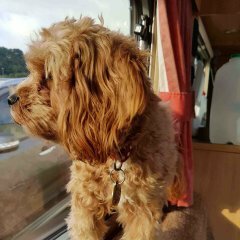 We have not found a way of doing this with the present caravan which we have had for 9 years and have to rely on motorway services. Thanks Geoff. I know that the main Clubs are not current members. I seem to remember that the cc were former members about ten years ago. I seem to remember, though I stand to be corrected, that until relatively recent years both of the main Clubs were members of the NCC. In my experience a caravan fridge does not work too well when towing unless it has been pre-cooled overnight running on mains electrickery and with the freezer section loaded with frozen food and/or ice blocks. It also helps if there are very few stops during the journey. My renewal invitation with CMC arrived yesterday also showing a £1 increase. There was also a change in T&Cs. I intend to renew with another company which will cost £2 more than last year but has T&Cs more suited to my needs. Before I had an ATC fitted by AlKo I was told that I had to have a permanent live feed. I assisted a friend, who is an auto electrician, to install the feed. It took half a day to install as the cable was fed through the bulkhead and inside the bodywork. I always connect the 12S plug to vehicle when the ignition is off as I can then hear the ATC going through the set up drill.. The towing vehicle is a VW 2004 Passat estate, not one of the new fangled stop start models. The first check that was made by Alko, before the vehicle was taken to the workshop, was the live feed with ignition in the off position. I also find it difficult to understand that an ATC would work with an intermittent feed. When we stayed at the Wood Farm Caravan park near Charmouth for three weeks last year we did not find what others have apparently found there. We would neither return nor recommend to anyone. Other opinions are available.